For more than 50 years, Bath Township residents Homer and Rosalie Steiner lived on 23 acres of peaceful woodland. 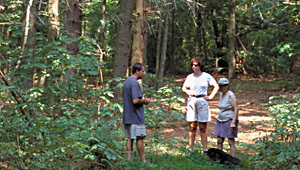 The couple opened the land to University of Akron students, who used the Steiner Woods property for a long-term amphibian research study. Researchers documented 13 species of salamander—including thousands of spotted salamanders—that use the extensive wetlands during breeding season. The Steiners wanted to ensure their land would always be preserved for research and education. The Trust for Public Land helped them realize that vision, negotiating the sale of the property to The University of Akron in 2002 using funds from the Ohio Environmental Protection Agency's Water Resource Restoration Sponsorship Program. Now, the university will continue its amphibian research project, manage the land to protect water resources, and coordinate with local schools to provide environmental education programs.